This has been a busy couple of weeks for me and I'm working to keep on top of all of this fun. I will be setting up for a trunk show with other local artists at a local store that features wonder "Arts and Craft" furniture and home accessories in the Tower Grove area here in St. Louis. Then the next weekend I will be at a women's conference at a major church here in Earth City. Also, of course, there is always some major event coming up at the bead store I work at. My boss always is planning new events to excite her customers. These are the times that "creating new pieces" can be challenging. This piece was fun because it was based on an design I created for a great up and coming jewelry designer. 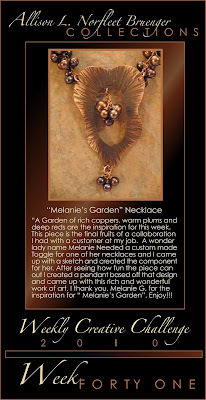 Melanie G. has been working nonstop on creating a wonderful body of work and I helped her by making a copper metal component for one of her beautiful necklaces. After creating the design, I can up this this pendant based off of the original piece and fell in love with the rich color of the copper and the texture I created in the metal. Then I found these great fresh water brown pearls with such rich colors that I felt would be a great fit for this pendant. This was truly a fun project and I thank Melanie G. for her inspiration. 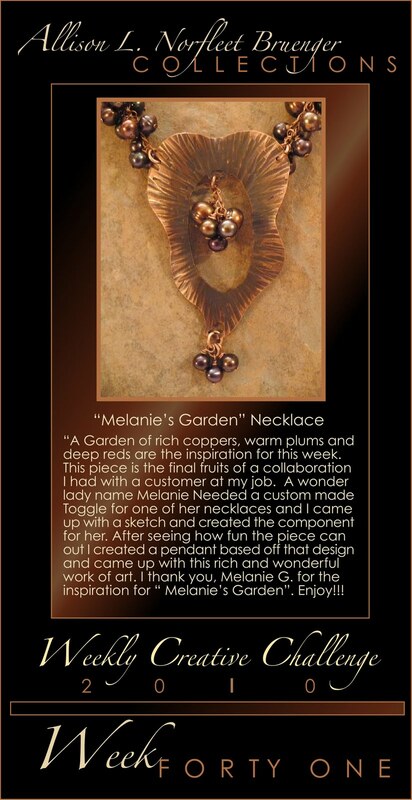 I hope you Enjoy "Melanie's Garden" Have a great week and a wonderful Memorial Day! Take Care and Keep Creating!